"A tomato and vegetable pork stew that is sure to please any crowd! It is a long cooking process, good for a day when you are staying at/working at home, but WELL worth the invested time." Toss together the onion powder, parsley, 1 tablespoon garlic powder, seasoned salt, 1 1/2 tablespoons black pepper, marjoram, cinnamon, and nutmeg in a large, resealable plastic bag. Add the cubed pork, toss until well coated, then seal, and refrigerate overnight. Preheat oven to 250 degrees F (120 degrees C). Line a 9x9 inch baking dish with half of the spinach leaves. Pack the marinated pork into the baking dish, and cover with the remaining spinach leaves. Cover the pan with aluminum foil, and bake in the preheated oven for 3 hours, or until the pork is tender. Heat the olive oil in a large pot over medium heat. Whisk in the flour, and cook for 15 minutes, stirring frequently until the flour has toasted. Scrape into a heatproof dish, and set aside. Melt the butter in the pot, and stir in the onions and celery. Cook and stir until the onion has softened and turned translucent, about 10 minutes. Add the mushrooms, and cook until tender; stir the flour mixture back into the pot to coat the vegetables. Pour in the beef broth, stewed tomatoes, cooked pork and spinach, bay leaves, red pepper flakes, and 1 teaspoon garlic powder. Simmer 1 1/2 hours. 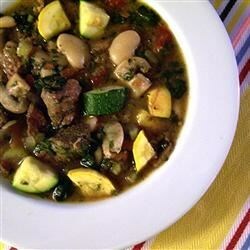 Stir in the butter beans, yellow squash, and zucchini. Simmer 30 minutes until the vegetables are tender. Season to taste with salt and pepper before serving. Good. Surprised at how spicy it is. Had to whip up a quick meal for the kids due to this. Husband asked me not to make this again and I will gladly accommodate that request. Wonderful flavor, but a little too time consuming! I ran out of time after toasting the flour, so I threw everything in the crock pot for 5 hours on high. This was GREAT. Even for the non-zuchinni fan in the house, we loved it. I used cannellini as this was my on hand bean...this is a keeper. Thanks!